I always have a little extra spring my step and a little more pep in my attitude this time of year. The looong gray days of winter are coming to an end and spring is on the horizon! 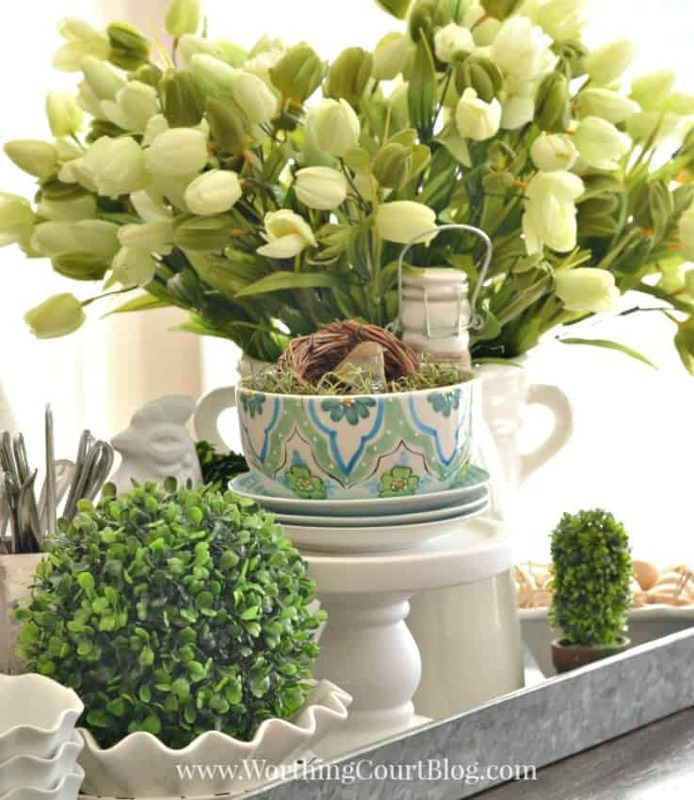 Just like many of you, I yearn for spring and that means one thing – spring decorating! I’m kidding – sort of. I’ve had spring decorating on the brain this whole month! Once the weather turns warm, I don’t want to be stuck inside putting a lot of complicated and time consuming decorations together though. 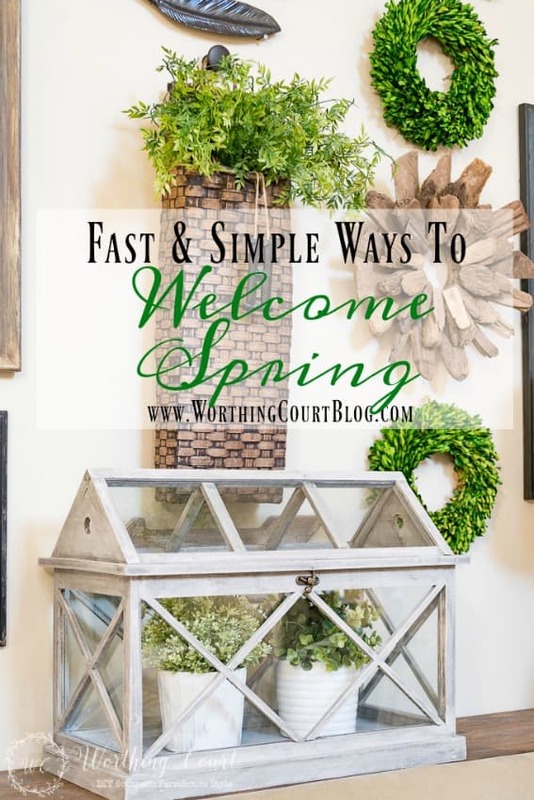 So here are six quick and simple ways that you can welcome spring into your home that will leave you with plenty of time leftover to get outside and enjoy the weather! This cutie was made with a grapevine wreath, some hot glue and seed packets and gardening gloves from the dollar store. Click HERE for the easy peasy tutorial. 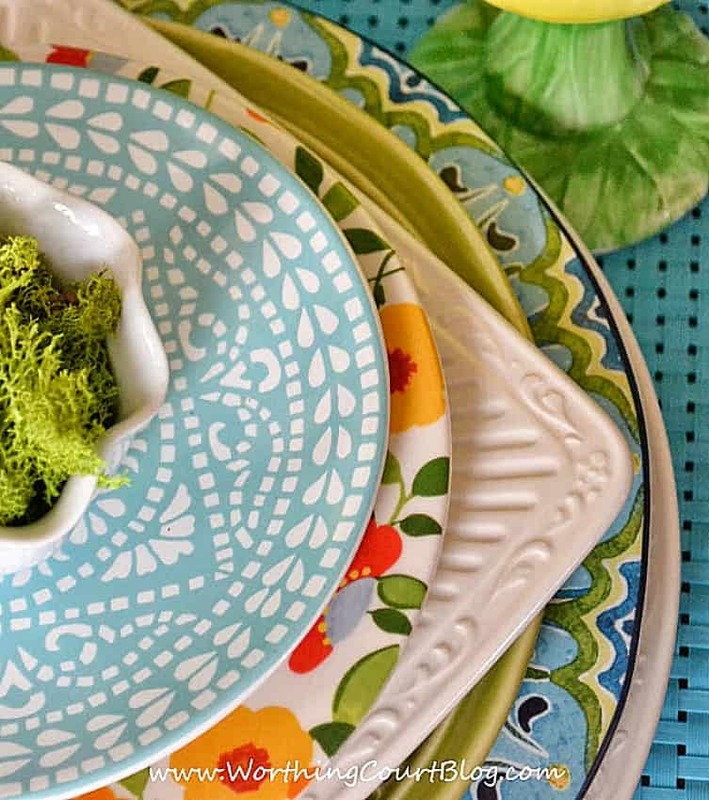 These colorful stacked dishes are part of a tablescape that I put together, especially for spring, in the kitchen of my former home. You don’t necessarily have to set a whole table – we’re trying to keep things quick and simple today, remember? You could do something as simple as pulling out a colorful container for displaying fresh fruit on your counter! Click HERE to take a look at the complete spring table setting. Three inexpensive pots from the floral department of my local grocery store inspired this spring vignette, located on the island in the kitchen of our former home. How could I say “no” to those sweet faces??? I simply placed them into a wooden box and filled in the empty spots with some Spanish moss. Click HERE to take a closer look at the entire vignette. Whether you display your winter throws on a blanket ladder or simply keep them draped over a chair, now is the time to replace them with their lighter and brighter cousins! And while you’re at it, bring in some lighter throw pillows too. Click HERE to take the full spring tour of my home last year. You’ve heard of “more cowbell”, right? No? Well…Google “too much cowbell” to see the hilarious skit on Saturday Night Live circa the year 2000. You can never have too much cowbell, nor can you have too much greenery when it comes to spring! Click HERE to see the entire centerpiece. Do you have any favorite ways for bringing spring into your home? 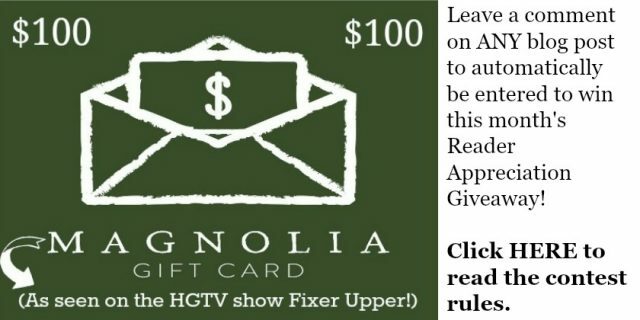 DON’T FORGET TO LEAVE A COMMENT TO AUTOMATICALLY BE ENTERED TO WIN A $100 GIFT CARD TO MAGNOLIA MARKET! I’m starting to get the itch to decorate for Spring! After all, it FEELS like Spring where we are. Love your ideas! It’s a little warm for this time of year here in WNC, so I’m of the mind to wait awhile longer, because March can bring snow!! Beautiful, love all the green!! I am ready for spring and am going to start the decorating process today, no matter what the calendar says. Love all the greenery. Thanks for all the inspiration. I love how you have brought color into your rooms. I have been collecting some beautiful faux flowers & greens. They have added such brightness to the rooms. Thanks for your wonderful ideas. Spring is here in Houston-maybe even summer! Temperatures have already been in the 80’s! Thanks for all the reminders of what needs to be updated. Our weather lately has said spring is on the way. Great tips. I am like you, I’d like to have things in place prior to so I can spend more time outdoors (well, at least until our awful pollen hits). Love the greenery! It really transforms a room. 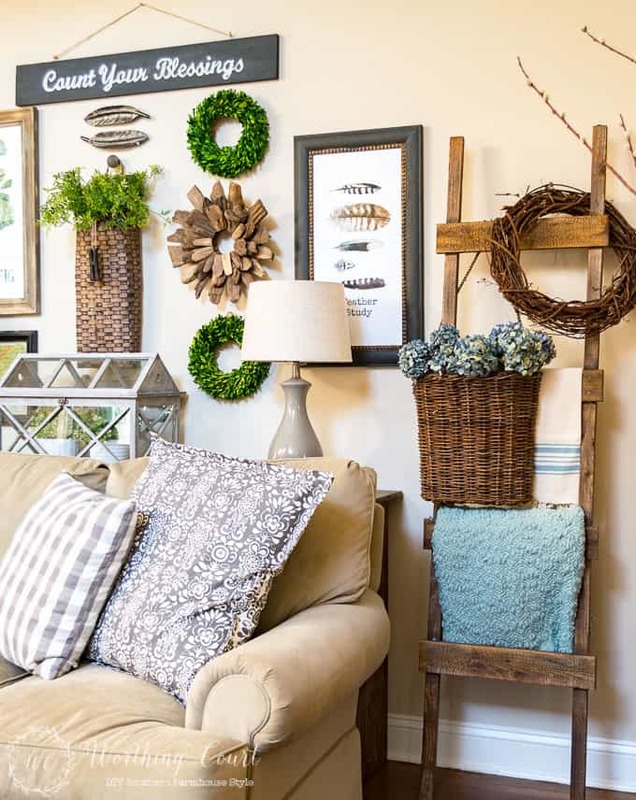 You always do such a beautiful job styling your home. It is decorated but not cluttered. I am wintering in an area where is has been unusually spring like. I am looking through all the stores to gather up finds to take back home to the Midwest. All the tulips and daffodils are in bloom and also the azelias. Your greenery is beautiful. I love your centerpiece! Simple but beautiful! i agree with everyone, spring has sprung and look forward to green the next few months! I like the pops of fresh spring colors. It gives a pleasant lift to my day. Spring is definitely here in Florida! I need to figure out how to make that gorgeous wood wreath or find it somewhere! LOVE IT. I love the spring greens too! Warm NC weather sure puts me in a Spring frame of mind!! I love all of your posts. You have a wonderful decorating touch! You continue to inspire me! I really like the seed packet wreath! They always have some great pictures on them and it’ s a great way to re-use them. Love your terrarium! do you remember where you got it? Thanks for the inspiration. Hi Lynn. I bought my terrarium at At Home. I like the terrarium on your bench also. The little potted plants inside look so good. I googled Too Much Cowbell on Saturday Night Live. I’d never heard of it before. Everything is fresh and pretty. 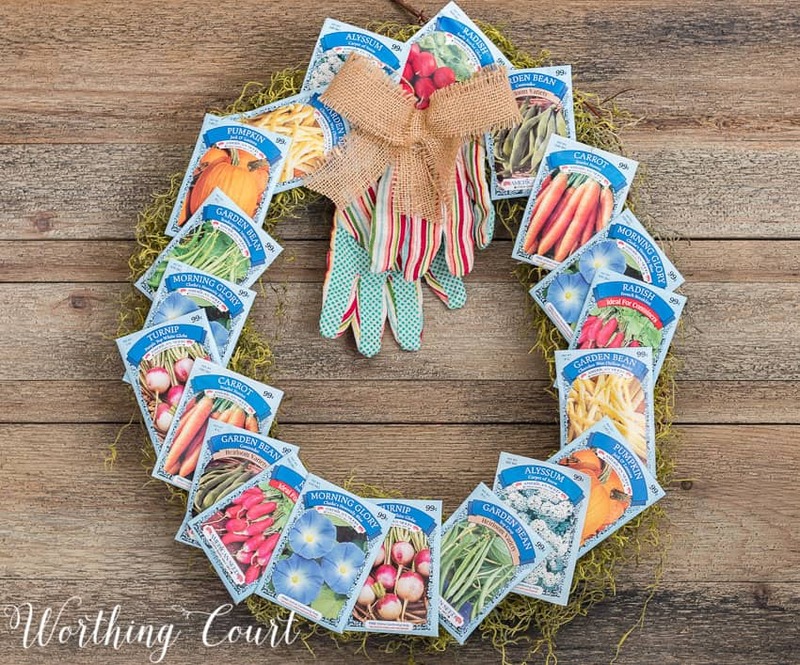 Love the seed packet wreath! Your spring topics make me feel I must get in that mode soon. In S.C. we are also having springtime weather. Love the garden seed wreath…… I think adding greenery is one of my favorite things. Yes!! Spring has sprung in NE Texas! Azaleas are blooming several weeks early with temps in the 70s and 80s in the past weeks. Love it! 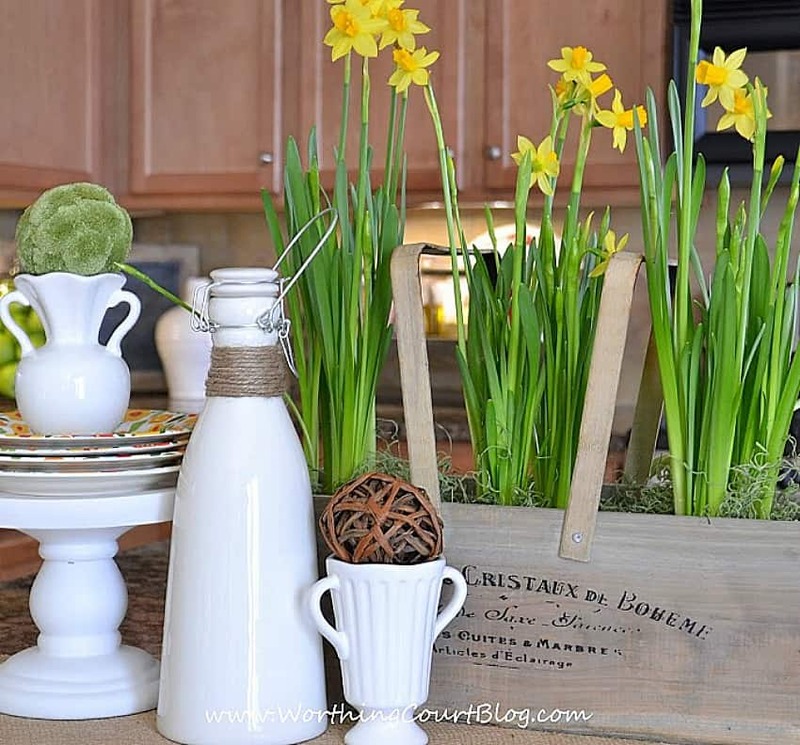 Thanks for the great ideas for bringing spring into our homes, Suzy! Thanks for spurring me on. Beautiful ideas! Now I’m in the mood for Spring–thanks for that! I hung a boxwood wreath on my front door today. Love the green! My daffodils are ready to burst, can’t wait for Spring! I love the wooden stylish things and accessories for home decor in this spring. GREAT IDEAS !! Spring Green always brightens up the indoors !! My daughter gave me cut hydrangeas for my birthday on the 11th. I can’t believe that they still look beautiful 10 days later! I’ve been changing the water every couple of days. If I could always keep cut flowers looking this good I’d always have fresh flowers! Love the ideas! Love Spring time!!!! Wonderful ideas! I’m working on some of these in my home right now. It’s in the 50s this week in Wisconsin, so I really feel like spring. The only thing is by Friday we are supposed to get a foot of snow. Great tips – and I love bringing in spring with potted forced bulbs – so pretty! Did you make your driftwood wreath? I love it – I would like to make one if you have directions and sources. I have seen them in our local craft stores but not are pretty as yours! Hi Heather Anne. No, I didn’t make my wreath. I found it in TJ Maxx a couple of years ago. Your home is lovely, especially with the touches of Spring. This teasing warmer weather encouraged me to remove the last of my winter greenery from my mantel. Looking forward to upcoming posts on seasonal decor. I love, love, love your blog. Your transformation of that cherry bookcase in your home office was beautiful. You certainly have an eye for the potential in things. I wish you were my neighbor! Its a gray day in Rochester, New York but your colorful and beautiful ideas brightened my day! Thank you for your lovely and practical instructions. With a brain injury I’ve lost much of my ability to make my home as lovely as before. Your do this, do that approach is exactly what I need. Your blog is an answer to prayer! These white tulips are so refreshing! My fav of all your suggestions! Yea Spring Love the ? Soooo ready for spring. Thank you for the inspiration to get started perking up the house. I’m looking forward to decorating for spring, too! Thank you for sharing all of the great ideas and inspiration! I really loved the daffodil centerpiece and may have to “re-create” that this spring! Blessings to you…. Love those daffodils, great idea to “bury” the pots in the moss so you don’t see them, think I will have to use this. I love all of your Spring decorations! I recently visited another home blog, and while everything was very pretty, it was ALL white. I quickly got tired of seeing nothing but white. Coming back to your blog made me so happy to see some beautiful soft Spring colors! Keep up the good work! I like your style! Thank you for all the wonderful spring decorating ideas. I would definitely label myself as “home-design challenged” but these ideas are simple enough that even I can implement them! 🙂 I think I’ll be looking for a more colorful set of dishes, and hopefully finding some fresh green accents to add around the house. HI Suzy, great idea to bring in spring. It is definitely almost time to change things. Thanks so much for sharing your helpful tips at DI&DI. Love these ideas! Especially the wreath and tucking some potted flowers in a container. Thanks! Those are such pretty ideas for decorations. Some great ideas. I love them all. I love the wreath. What a cute idea! Your home is lovely–thank you for the springtime ideas!